Karpathos is the second biggest island of Dodecanese and is situated between Rhodes and Crete. The capital of the island is the city of Karpathos, which also goes by the name Pigadia. The variety and the chromatic magic of the natural environment are simply unique. Everything seems so contradictory, yet so well blended that won’t bore you even for a minute. MOTO CARPATHOS, based in the capital of Karpathos named Pigadia, has been in the motorbike rental business for years. Our long term experience has provided us with the knowledge that the primary concern of visitors is to hire safe and reliable motobikes. At MOTO CARPATHOS, we recognize that each individual, family, party of friends or professional has different needs and preferences and we offer a large variety of choices. The island of Karpathos is the favorite destination of those who love water sports and mainly windsurfing, but also of those who seek for quiet holidays, by the sparkling blue waters of the Aegean. The island is beautiful with nice organized beaches for every taste. The topogeography of the island makes the use of a car indispensable. 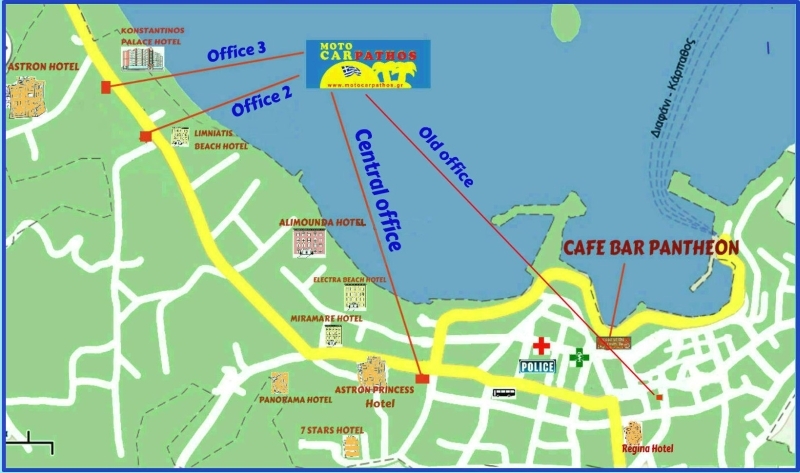 The staff will be more than happy to provide you with useful information and tips about the attractions you need to see and the areas you need to visit during your stay in the island. In addition, don't forget that we provide you with unlimited kilometres, free helmets, free pickup and delivery service within 20km from Pigadia and free road insurance!